Thanks to KC Montero's tweet, Bamboo breaking up was the talk of the town for the most part of yesterday, 10 January. [firstpara]At 4:50am today, 11 January, FHM.com.ph received an SMS from EMI Polyeast, telling us to please visit the Bamboo's website for the band's official statement. And there for all to see is the announcement. After a short history and a little backgrounder is a six-worded statement, written in all caps, written in bold red for all to see: "It's official-the band-it's over." After a few words more thrown around, it was signed by band vocalist Bamboo Manalac. And just like that, another dagger to the heart of Pinoy Rock. It is amusing to note that these recent Pinoy Rock endings, we have yet to encounter the band members copping out with the "creative differences" explanation. Instead, we get a "things change" line of thinking, as we did from Bamboo himself. "A chapter closes and a new one begins," his explanation continues. And though he admits to not knowing what's gonna happen next, Bamboo promises that "This is not the end." 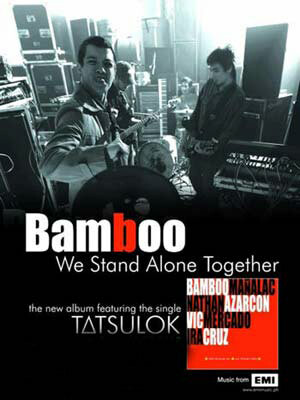 In 2002, Bamboo and fellow Rivermaya, uhm, graduate Nathan Azarcon and formed the band. They were signed by EMI in 2003 and released their debut As the Music Plays the Band early in 2004. It reached double-platinem status, signaling a rebirthof sorts for Pinoy rock. They have released four albums to date. "What now?" FHM.com.ph asked EMI Polyeast. All they could muster, really was a resigned but promising "abangan nalang natin."